The wedding is the name of biggest celebration, joy and love. It is what urges every single soul to look perfect. And if we talk about a woman’s celebration, she wants it all perfect from head to toe. Getting that wholly perfect look is not everybody’s thing, merely perfectionists get that standing outlook. As for the modern era is concerned, many people are working to make this art of classiness and perfection propagated over the globe. These people are called the designers! 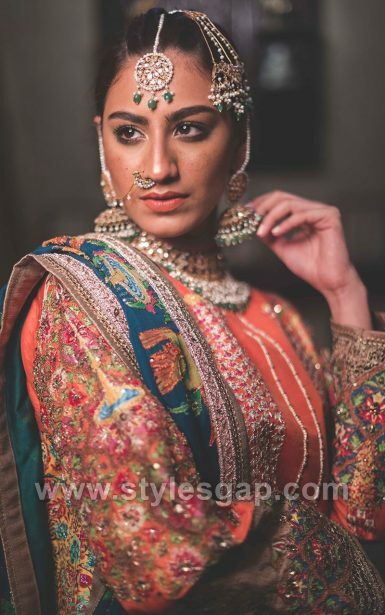 Yes, the community that has always been working for quality, style, and innovation, but these days the trend of wearing brands has caught fire and it is considered a part style statements to use those tags. Among those popular tags, resides one that has been producing art and aesthetics and has conquered this designer community with his majestic designs. 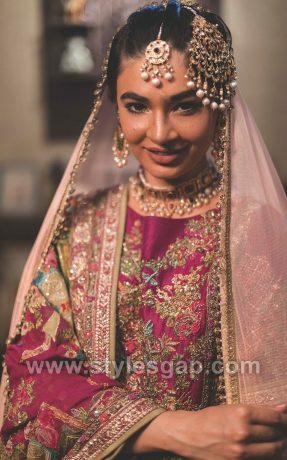 Today we will share the amazing designs by Fahad Hussayn Latest Pakistani Designer Bridal Dresses Collection 2018. 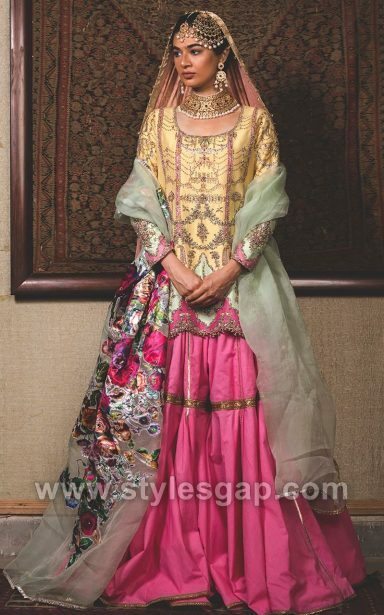 None other than Fahad Hussayn can master this art like this. FH couture purposes to offer elite class fashion garments and bridal goods splendour as the main features of it; and produces casual, formal wear, men dresses, women dresses, bridal wear, pret wear and occasional dresses for every new event. His unique conceptions portray fine art and traditional schema in such a refined way that one witnessing those designs, with no trouble, would find out the artistic thinking behind those creations. Blending up east and west his designing has eastern prints over western cuts, contemporary motifs over chic prints and quality fabrics. 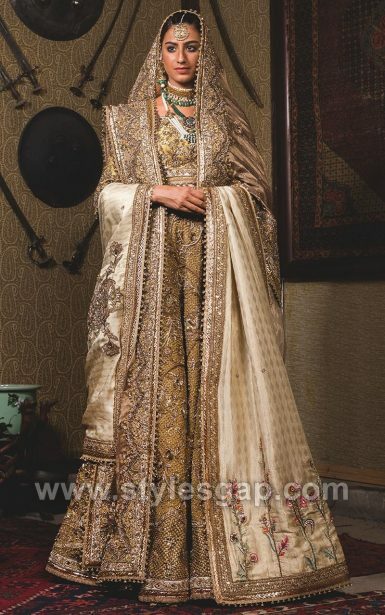 Fahad hussayn with his traditional aesthetics has now launched a sophisticated and royal collection. 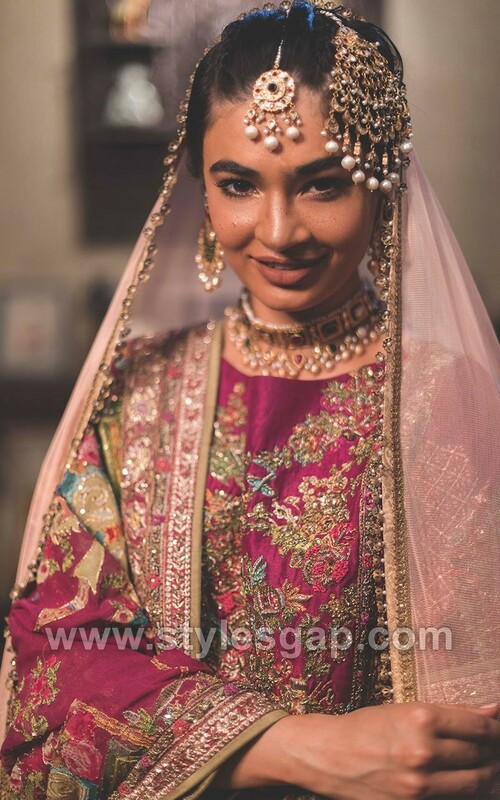 Fahad Hussayn Latest Pakistani Designer Bridal Dresses Collection 2018 is a tremendous assortment of contemporary and intricate embroideries forming an amalgam of fine quality attires with amazing digital prints well inspired by artistic values. 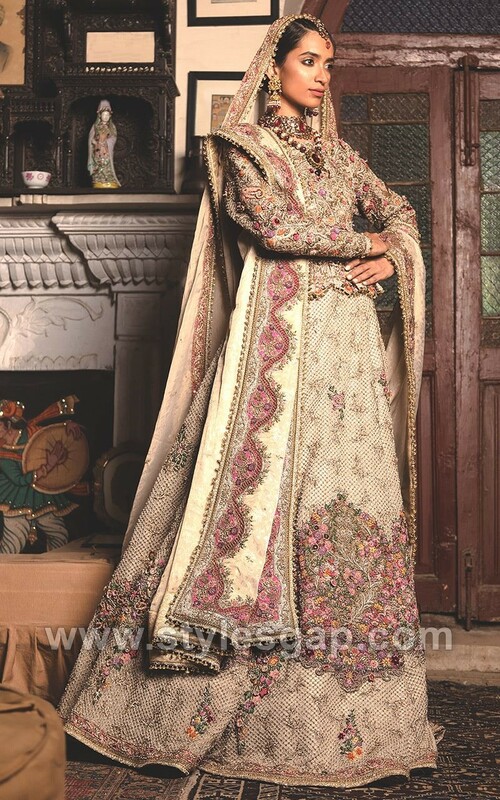 The fabrics include chiffon, silk, crinkle, Georgette, net, organza, sheer jacquard stuff. Dragging motivations from tiny articles, the prints of his latest release hold faces, flowers, abstracts and lot more fusions of hues & shades. 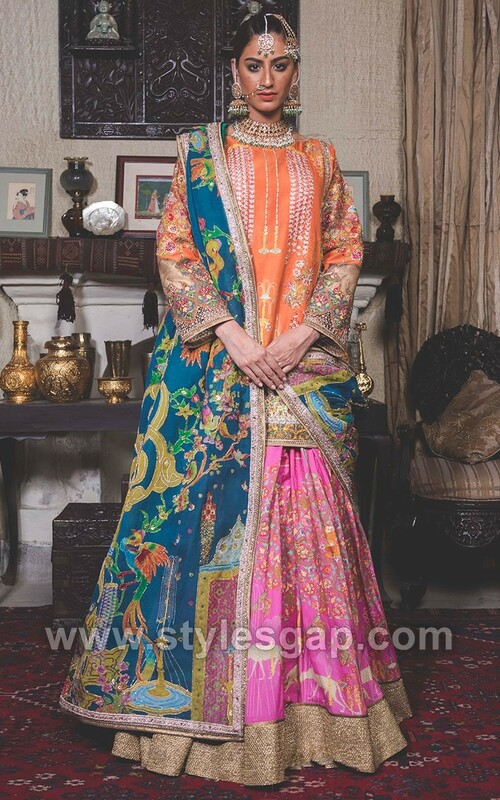 Like all his assortments, Fahad has combined the western theme of dressing with eastern aspire of printing and stitching. Check out the amazing styles and designs of mehndi dresses, gharars, lehengas, etc. Colors like yellow, orange, pink, off-white are used. 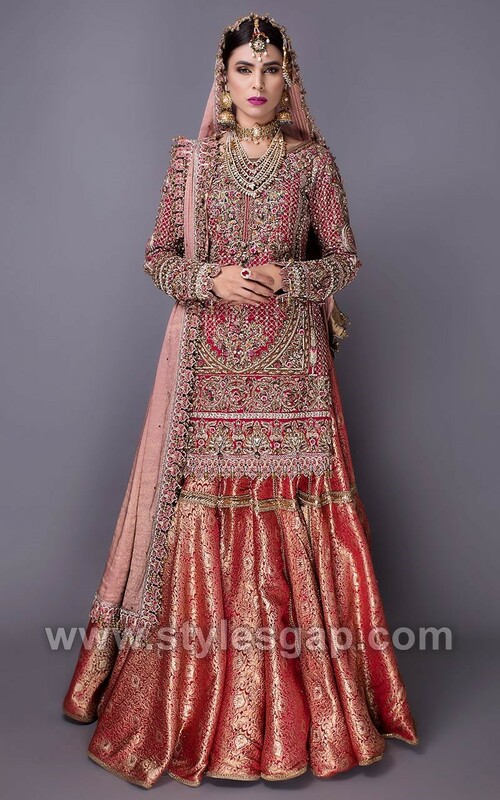 This masterpiece created by the guru complies with a royal pink silk blouse with kundanzari embroidered sleeves. 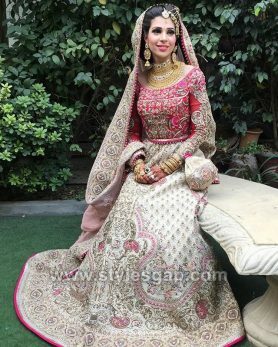 It is paired with heavily embellished lehenga and four-sided embroidered border pure chiffon dupatta with orange piping in plum pink. 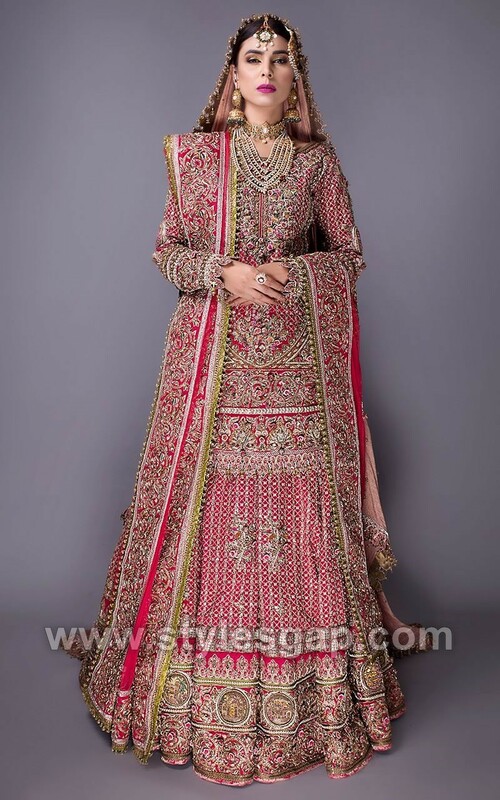 Double Dupatta Bridal lehenga by Fahad Hussayn. 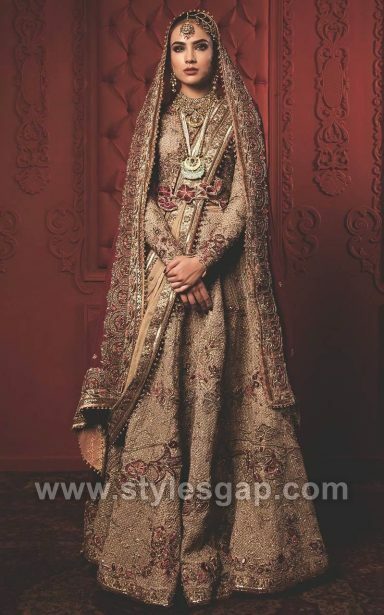 The double dupatta trend is still very famous and considered to be royal. 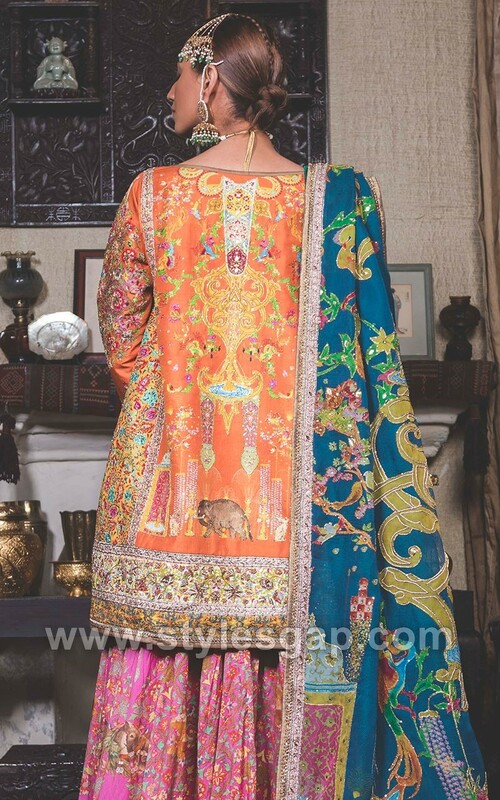 Both dupattas are chosen with the different color contrasting combination. One is heavily embroidered while the other is kept light. 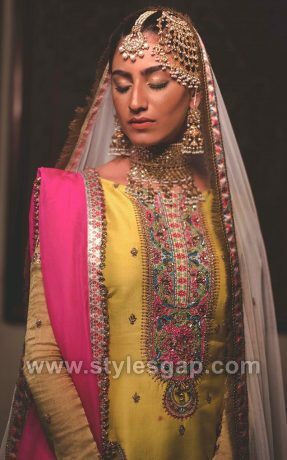 For you to get inspired and get dressed up in royalty, we’ve brought the array to fill your formal closet by Fahad Hussayn Couture. 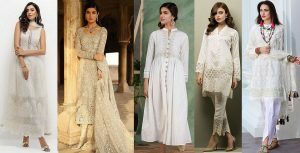 So give a glance at the wonderful bridal collection below, choose the one you love and grab that from your nearest outlet. 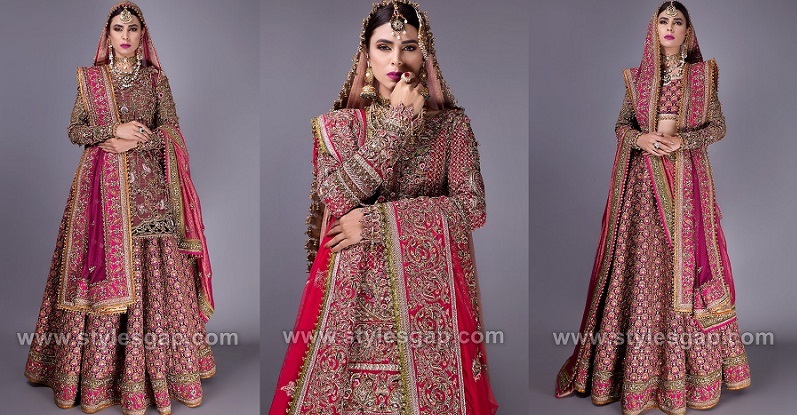 For more information and dresses details, check out the brand’s official website. Visit StylesGap more often to get your styling updates right at your home.